We recommend skipping the base engine in favor of the larger, 2.4-liter four-cylinder; it only gives up a small amount of efficiency and won't require as much prodding to maintain normal speeds. The 2015 Hyundai Tucson is a stylish choice in the compact crossover segment, with solid but unexciting powertrains and a strong feature set. Some compact crossovers channel tougher SUVs in their design and equipment, but not the Hyundai Tucson. Like rivals from Ford and Kia and Honda, it puts all its effort into smoothing out the road ahead, and coddling as many as five passengers--on the street, not in the dirt. It starts with the design. 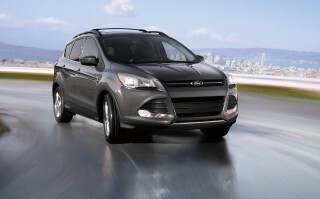 Sharp lines up front flow into curvaceous forms along the sides and rear that say sedan more than they do SUV. The profile view is all curves, with subtle rises for the fenders. LED taillamps and projector headlamps with LED accents are modern touches available on some models, while an available panoramic sunroof helps cast it in a more upscale light. The interior's just a shade less dramatic than the exterior, but it fits right in with the rest of the current Hyundai lineup. 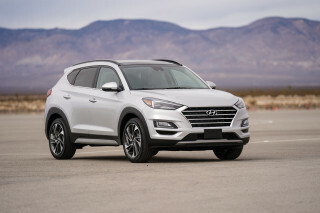 Last year, Hyundai gave the Tucson a pretty substantial mechanical upgrade, with new direct-injection engines as well as new Sachs dual-path dampers. The engines make just a little more torque than those of the same size (2.0-liter and 2.4-liter) fitted previously, and fuel efficiency is up slightly, too. It's still probably wise to stick with the 2.4-liter versions; the 2.0-liter is only adequate. In either case, there's no manual; a responsive six-speed automatic makes the shifts. Previous Tucsons tended to ride somewhat harshly, and the new dampers improve comfort without negatively affecting handling. There's a good amount of head and leg room in front. The seats themselves have good back support, although the bottom cushion is short and tilts down a bit too much; and that can make them uncomfortable on anything more than a short drive. The rear seat has just enough headroom for taller adults, and good leg room. Given the choice, we'd steer clear of the optional leather seats: the front leather buckets have short bottom cushions that tilt down at their leading edge, leaving them less comfortable than they could be. Safety is sweet and sour. While visibility is actually quite good, and the Tucson checks all the right safety boxes, crash-test results place it mid-pack among compact crossovers. Its four-star federal scores and 'poor' small overlap frontal results don't approach the top tier, which includes vehicles like the Subaru Forester. Standard features for the base Hyundai Tucson include air conditioning, Bluetooth hands-free calling and audio streaming, keyless entry, a USB port, satellite radio, and power windows, locks, and mirrors. Automatic headlights, fog lights, and heated front seats are also included in the GLS. SE models also now add a rearview camera system and 4.3-inch touch screen. The top Tucson Limited adds leather seating, navigation (a new system with a larger seven-inch touch screen), as well as voice recognition, HD Radio, and the BlueLink suite of services. Changes for 2015 are limited. There's a new Popular Equipment Package available on the base GLS model, adding items like a touchscreen radio and power driver's seat, while Limited models now get LED taillights as standard equipment. Fuel-economy figures range from a low of 20 mpg city and 25 highway for an AWD 2.4-liter model to a high of 23 mpg city and 29 highway on the front-drive 2.0-liter model. These aren't stellar numbers, but they're within range of most of the others in the segment. The Tucson's slippery shape doesn't have a hint of SUV in it--and that's just fine. The 2015 Hyundai Tucson manages to eschew the beefy, squared-off SUV look while still appearing rugged enough to tackle foul weather and the occasional dirt road. To put it simply, the Tucson is unabashedly curvaceous. There might be an inch of straight line in its silhouette, the rest given up to surfacing that swells at the fenders and crests at the front and rear. We think that's a good thing, as it really sets the Tucson apart from other rivals. 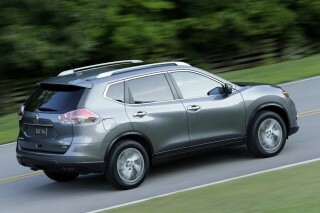 It's curved, crested, and looks quite upscale from nose to tail, almost like a miniature luxury crossover. It gets a little tall and thick toward the rear--some problems can't be solved with arcs of chrome trim--but the angular taillamps drop some of the visual weight out of the rear end. LED taillamps and projector headlamps with LED accents are available on some models, while an optional panoramic sunroof with roof side rails casts it in a different, more upscale light. Inside, the Tucson hits the same high note. The interior's just a shade less dramatic than the exterior, but it fits right in with the rest of the current Hyundai lineup. A big LCD screen sits atop the center stack, and vertical blades of metallic trim knifing into bands of tightly grained, low-gloss black plastic. 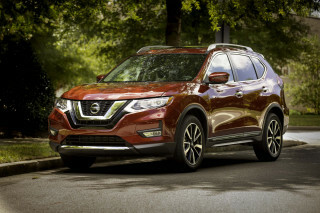 You can do better in this class for fit and finish, but even after the introduction of the latest Ford Escape and Mazda CX-5, the design remains a standout. Aesthetic changes for 2015 are limited to the LED taillights being made standard on all Tucson Limited models. The Tucson's engines have been updated, but it's still an economy car at heart. The Tucson is small enough that it does just fine with either of its four-cylinder engines--although the turbocharged four that comes in the Kia Sportage SX--the Tucson's platform mate--is still missing here. We suspect the reason is to differentiate the two further, but it also makes a good reason to check out the peppier Kia if the Hyundai feels slow for your taste. Last year brought two updated engines to the Tucson. 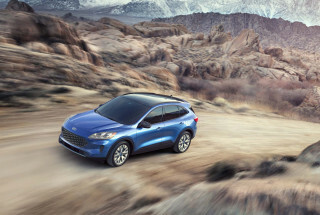 Both the 2.0-liter and 2.4-liter in-line four-cylinder engines got direct injection, raising available torque and giving fuel economy a slight boost. The base 2.0-liter engine makes 164 horsepower and 151 pound-feet of torque; step up to the 2.4-liter, and you get 182 hp and 177 lb-ft. There's no manual gearbox available in the 2015 Tucson; all models come with a six-speed automatic transmission that includes Shiftronic manual controls. You do have a choice between front-wheel drive and all-wheel drive throughout the lineup, something that's not true of most competitors, who generally limit all-wheel drive to larger engines. The 2014 model also brought with it an improved suspension setup with Sachs dampers. Although we haven't driven one, we expect an improvement over the previous models, which had a tendency to ride harshly, even if they handled reasonably well. The new dampers promise to improve ride without dulling handling response. We've found the engine-speed-sensitive electric power steering to be a weak spot in some otherwise very pleasant driving dynamics. Adults will fit in the back seat of the Tucson, but it's on the smaller side of the crossover class. The Hyundai Tucson's interior is nicely designed, with mostly price-correct materials, but it doesn't really stand out in any special way. In many ways, the 2015 Hyundai Tucson is about middle of the road within its segment, and that's true of its interior space. There's a bit more usable room than in the Ford Escape, although definitely not as much as in the Honda CR-V, Toyota RAV4, or Subaru Forester. There's a good amount of head and leg room in front. The seats themselves provide good back support, but the bottom cushion is short and tilts down a bit too much, which can make them uncomfortable on anything more than a short drive. Two adults will fit easily in the Tucson's rear seats. We'd recommend the cloth ones over the leather upholstery, which seems to bring a less shapely, more flat seat design. Two-stage recline and 60/40-split seatbacks are now included, so that might aid comfort. There's no space for a third row in the Tucson, but it does have impressive cargo space, considering its very compact exterior. Fold down the seats, and you get the sort of rectangular, wide-open area that's good for pets--or moving small pieces of furniture if you fold the second-row backrests forward. There are plenty of small storage spaces scattered throughout the cabin--with cubbies and bottle holders in the console and door panels, and a deep glove box. The only surprise is that there is so much hard plastic inside, even if fit and finish has been good in all the Tucsons we've driven. The Tucson's longer wheelbase helps provide a comfortable ride, which we expect will have been improved by the fancier Sachs dampers that were added for 2014. Safety scores have not been impressive in the Hyundai Tucson. Overall, the Hyundai Tucson has fared okay in crash testing, but the new small-overlap crash test puts a big blemish on its record. The insurance industry-funded Insurance Institute for Highway Safety (IIHS) has tested the Tucson in all its categories and given it all 'good' ratings--except for one very noteworthy fail: a 'poor' rating in the important new small-overlap frontal test. The National Highway Traffic Safety Administration (NHTSA) gives the Tucson an overall score of four stars, which includes a four-star score on frontal impact protection and rollover resistance, and a top five-star score in side impact tests. One noteworthy positive is that, among other class competitors--and despite the curvaceous body--outward visibility is quite good in the Tucson. The Tucson covers all the familiar bases for safety-conscious shoppers. In addition to all the usual airbags and stability systems, hill descent control is also standard, along with brake assist, tire pressure monitors, and active headrests. A rearview camera is available, and Bluetooth is standard. The Tucson can be outfitted with Bluetooth, a navigation system, leather, and a satellite radio. The Hyundai Tucson made a name for itself years ago by offering more features for less money than the competition. While the current-generation Tucson still crams in a lot of value, it's no longer the feature standout it once was. Standard features for the base Hyundai Tucson GLS include air conditioning, Bluetooth hands-free calling and audio streaming, keyless entry, a USB port, satellite radio, and power windows, locks, and mirrors. The 2.0-liter engine is standard on the GLS, while trims above include the 2.4-liter. SE models add heated front seats, a power driver's seat, a rearview camera system, and a 4.3-inch touchscreen audio system. 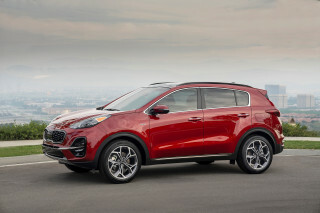 The top Tucson Limited adds leather seating, dual-zone automatic climate control, pushbutton start, and the BlueLink telematics system, while a Tech Package bundles a 360-watt sound system, a seven-inch touchscreen navigation head unit, voice recognition, HD Radio, and a panoramic sunroof. For 2015, all Limited models now include LED taillights. There's also a Popular Equipment Package available for Tucson GLS models. This package adds seating with leatherette seat bolsters and cloth inserts; a rearview camera; a 4.3-inch color touchscreen head unit; an 8-way power driver's seat with power lumbar support; and automatic headlights. The Tucson's new engines haven't helped it match the most economical crossovers on the road. 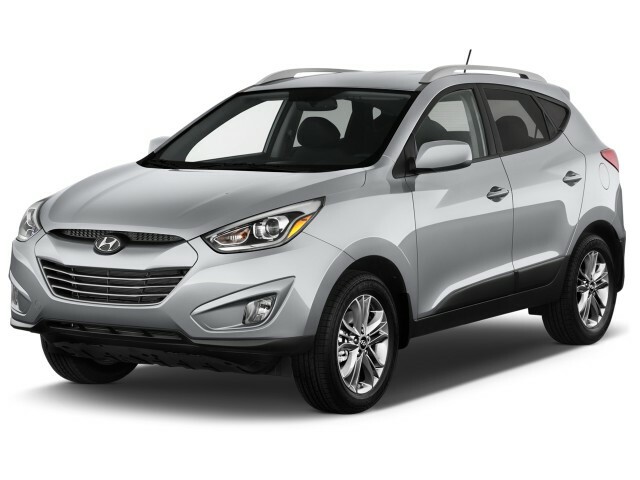 The 2015 Hyundai Tucson has respectable fuel economy for the segment, neither chart-topping or bottom of the barrel. The base Tucson GLS with the 2.0-liter four-cylinder is rated by the EPA at 23 mpg in the city and 29 mpg on the highway with front-wheel drive. 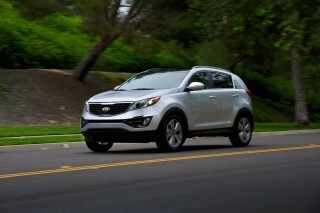 All-wheel-drive 2.0-liter models return 21/25-mpg ratings. 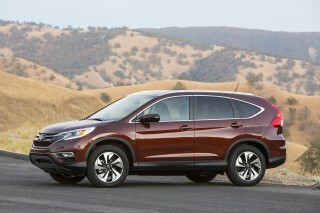 With the larger, more powerful 2.4-liter four-cylinder, standard on the upper trim levels, ratings go down only slightly. 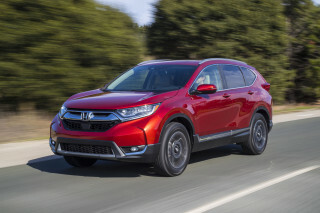 Front-drive models are rated by the EPA at 21/28 mpg, while all-wheel drive drops the rating to 20/25 mpg, which is very close to the smaller engine's AWD numbers. Regardless of driven wheels, the 2.4-liter is a worthwhile upgrade, especially because it only requires a small economy hit and makes up for it in features included on upper trim levels and drivability. 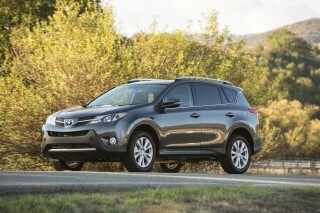 We were set to purchase a Rav4 when friends suggested we look at Hyundai. We were impressed with how much room the Tuscan has along with the great ride.